Land Readjustment, a land management tool that encourages the voluntary participation of landowners to assemble plots (Hong, 2007), developing the projects by sharing the value of the land equitably (Hong & Cheng, 2014), to recover the costs of infrastructure and services (Doebele, 1982), has been implemented in Colombia since its legal introduction with law 388 of 1997. Even though a legal framework exists, there are institutional deficiencies in the implementation process of Land Readjustment (LR) in Colombia, there is the possibility of landowners not participating voluntarily, and the leadership of the private developers might not be guaranteeing equity. 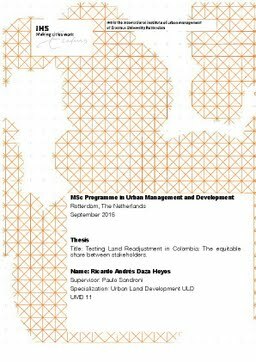 Therefore, this research aims to test the equity between stakeholders of Land Readjustment (LR) projects in Colombia on Sharing the Value of Land. By doing a random representative sample of projects around the country, and gathering quantitative information from the documents that enacted each of the projects, and qualitative data from interviews conducted with key actors in specific projects, this research will compare, the results obtained with the statements of Land readjustment theory. By conducting this research, it was possible to find that, there is s a statistically significant difference, between the benefits that each group of stakeholders receives, and the contributions they do. There is also evidence that the original landowners are not participating in the Land Readjustment projects. With this findings it can be concluded that Land Readjustment projects in Colombia differ from the theoretical Hypothesis, because the fact that, original landowners are being bought out by other stakeholders, contradicts one of the main characteristics of Land Readjustment, the voluntary Land Assembly method; and the action of developers, receiving more benefits than what they should, has created an inequitable distribution of the benefits, deviating from what theory has stated. It will be important that Land Readjustment projects in the future, involve the original landowners in the project development to maintain the transaction costs low. Furthermore, it is essential that municipalities do an assessment process after to enactment of the projects, to accompany the implementation process, and guarantee an equitable distribution of benefits and effective implementation of the projects.